Produced from the Taggiasche Olives, a quality that is typically Ligurian from the western Riviera, dark-green and small size olives. Plants that give this type of olive are century year old and were planted in ancient times by the monks and cultivated on terraces overlooking the sea. Fundamental elements for an extra-virgin olive oil are an intense, pleasant aroma and colour. The extra-virgin oil from Taggiasca olives distinguishes itself in its "sweet fruity aroma and delicate mellow taste with a nice bouquet". No doubt it is known as one of the best national oils, because its taste is more delicate and this makes it the ideal complement of all gastronomic recipes. Fundamental elements for an extra-virgin olive oil are an intense, pleasant aroma and colour. The extra-virgin oil from Taggiasca olives distinguishes itself in its "sweet fruity aroma and delicate mellow taste with a nice bouquet". No doubt it is known as one of the best national oils, because its taste is more delicate and this makes it the ideal complement of all gastronomic recipes. 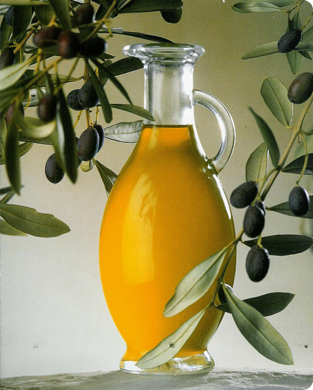 The secret of the Taggiasca olive oil is "use it in the right quantity and in the right way". There is no need for being a taster to recognize a good oil, just smell it and taste it for a guarantee of its genuine origin.